BackCheck is a rapidly growing firm in the field of Human Resources Outsourcing. 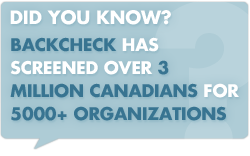 With thousands of clients ranging in size from 50 to 150,000 employees, BackCheck is a leading provider of pre-employment due-diligence. The following facts and statistics regarding occupational fraud were taken from the Association of Certified Fraud Examiners' (ACFE) nationwide survey of its Canadian members. The study intended to describe the context of occupational fraud in Canada, how it is committed, detected, who is responsible, and the outcomes. Fraud of this nature can impact any organization. Privately-owned companies were more affected than public companies. 38.2% of fraud occurred in private companies, 23.6% in the public sector. The most affected industries in their survey were government and public administration (13.3% of all cases), retail (11.1%) and financial (10%). The study found that smaller organizations with less than 100 employees accounted for42.2% of the victim organizations. The median fraud loss was $150,000 CAD. Likely this can be attributed to fewer internal fraud controls due to a more restricted resource base. Occupational frauds are committed by all levels of employees in an organization. 42% were committed by employees, 38.6% by managers, and 19.3% for owners/executives. These members of an organization tended to commit the largest frauds with higher median losses (around $1million CAD). The survey respondents estimate approximately 5% of revenue is lost every year from the average Canadian organization to occupational fraud. Indirect costs of occupational fraud include lost jobs, reduction in stock prices, and increased unemployment. The largest losses were incurred by the largest organizations in the study (more than 100,000 employees). The losses suffered amounted to a median loss of $452,500 CAD. More frauds were detected by accident than by internal or external audits. These frauds discovered by accident accounted for a median loss of $200,000 CAD. 88.9% of the individuals committing occupational fraud had never been convicted of a fraud-related offense. 11% had prior convictions, or were charged but never convicted. In 36.2% of the occupational fraud cases, the victim organization did not recover any losses. Organizations with fraud hotlines cut their occupational fraud losses by an estimated 50% per scheme. Internal audits, external audits and pre-employment background checks contribute to a reduction of losses also. Some characteristics possessed by organizations prone to fraudulent activity: inadequate pre-employment background checks, high turnover, distant management, high turnover, inadequate employee loyalty and commitment, etc. Employee theft accounts for 46% of shrinkage in North American Industry. - University of Florida. 2001 National Retail Security Survey-Final Report. Employee theft costs nearly 1% of total annual sales in North America. The U.S. Chamber of Commerce estimates that 75% of all employees steal at least once, and that half of these steal again ...and again. The Chamber also reports that one of every three business failures are the direct result of employee theft. - Bureau of Justice Statistics. Cost of turnover estimates range from $8,839 for an $8/hour unionized employee and $56,844 for a store manager in a retail grocery setting. University of Dallas, Coca-Cola Retailing Research Council. The average “bad hire” that leaves a company within six months costs the company approximately $40,000 in severance pay, training, wasted human resource time, possible search firm fees, loss of productivity and impact on employee morale. The following statistics regarding retail loss prevention are taken from the Retail Council of Canada's 2004 Canadian Retail Security Report Executive Summary. The total annual inventory shrinkage averages 1.23% of total sales. Internal theft accounts for 48% of annual losses. Of the 14 participating respondents with a 2003 consolidated sales volume of $25.9 billion, 5 respondents replied to the impact of shrinkage on their respective organization's net profit for an average figure amounting to 27.7% or more than $318 million. Retailers report that hiring and retaining staff continues to be a challenge. Respondents continue to identify high turnover in sales and management personnel as a major issue. The protection of business and response to crime occurring in business is increasingly becoming a business responsibility. Over the years, police have becomes less responsive to criminal events and threats occurring in retail stores.